In addition to pushing forward motor efficiency, SEW has been working to push more decentralized control platforms, which help bring the modularity of on-machine control to material handling systems that require large and centralized PLC processors. The MOVIFIT FC field bus controller can be used to control up to 10 MOVIGEAR DRC electronic motors, but practically it is best to limit it to the 7-8 range. The MOVIFIT FC forms a “local group” of DRC motors which are controlled using SEW’s proprietary MOVIGEAR SNI bus cable, which is a single cable power and data solution. 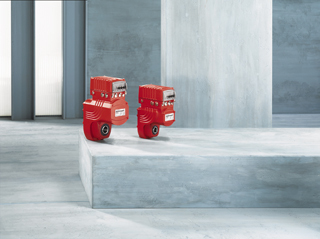 The MOVIFIT FC consolidates local control and feedback on the motors, and communicates with back to the centralized PLC processor via an industrial network, such as Ethernet/IP. There are some basic design constraints to consider when planning a distributed control MOVIFIT and MOVIGEAR solution, along with some more advanced design constraints and consideration. Basic design constraints mainly consider the allowable length of a single SNI bus cable network, which is 100 meters. In addition to the MOVIGEAR SNI bus cable, a separate 24V DC safety circuit is also required to be daisy chained to each motor. 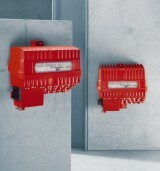 This circuit can be controlled by any standard safety or control relay; however, care should be made to ensure that no more than 12-16 MOVIGEAR motors are on a single safety power circuit, controlled from a single Class II 24V DC power supply. Two of the touted features of the MOVIFIT and MOVIGEAR distributed controls solution are the on-board I/O on each of the MOVIFIT and MOVIGEAR units, and the built in shaft encoder in the MOVIGEAR unit. In practice, the MOVIGEAR encoder is all but useless for a material handling system with large centralized PLC processors used to track and control product movement. The encoder resolution attainable through the network delays imparted by the various network hops would be insufficient for most tracking system requirements. 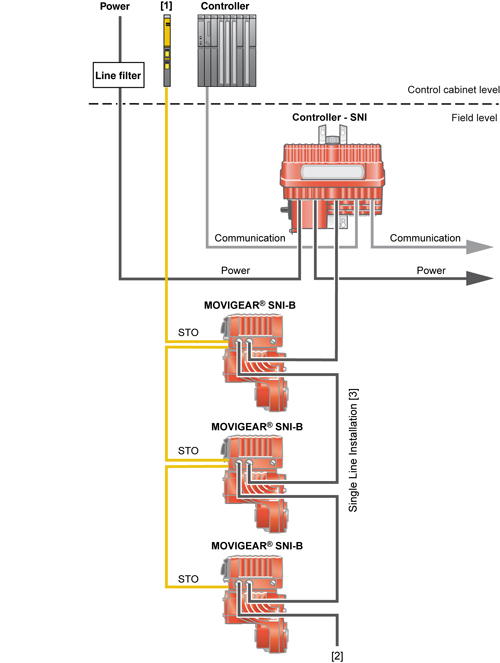 The on-board I/O for the MOVIGEAR and MOVIFIT units can be utilized, but has similar constraints in it’s usability due to the near 200ms feedback delay imparted by the SNI bus cable, and the MOVIFIT FC local logic routines. The MOVIGEAR I/O will also lose power in the event that the local motor safety disconnect is turned off. The fact that MOVIGEAR I/O is only available when the drive is under power, and has an approximate 200ms delay in feedback to a centralized processor, limit their usability to signals monitoring drive and disconnect feedback. The MOVIFIT unit is equipped with 12 inputs and 4 selectable input/output points. These I/O points will still experience significant delays in reporting and responding to centrally controlled PLC logic, but will remain under power during normal operation of the machine equipment they control. These I/O points could be effectively used to control and receive feedback on system status indicators, operator interface push buttons and selector switches, and other non-time critical system events. There are three main advantages which the MOVIGEAR and MOVIFIT decentralized control solution will bring to the implementation of a large scale material handling project. The MOVIGEAR allows mechanical engineers to standardize on one gear and drive assembly package to cover various belt speeds, while the constant torque provided by the servo based drive system results in a tighter range of motor power (HP of kWh) required for the various starting loads expected across various lengths of conveyor belts. The net result is procuring 1 or 2 drive packages in large quantities, instead of 10-12 gear box and drive packages in smaller quantities. This makes the product procurement schedule much simpler, and can often result in shorter lead times for bulk item purchases. The same advantage is felt by the Operations & Maintenance (O&M) team, as they have significantly less spare parts to stock, house and maintain. The third main advantage is the use of off the shelf products, replacing custom built panels whose manufacturing can be a choke point in a project schedule. Overall, the SEW MOVIFIT and MOVIGEAR is a very forward thinking solution to a large scale material handling distributed controls system. The long term benefits of the super-premium efficiency IE4 class motors will help end customers reduce their overall power expenditures, and qualify for tax incentives often associated with “Green” infrastructure improvement projects. The migration towards more modern industrial control networks such as Ethernet/IP is a large step for the controls world, replacing slower legacy networks such as ControlNet, DeviceNet and ProfiBus.